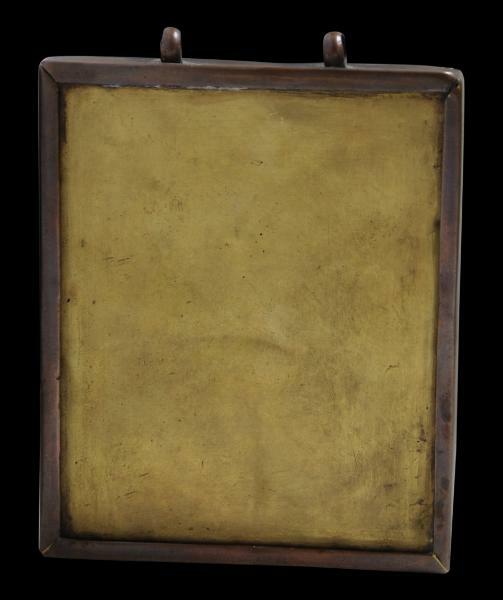 This small framed case comprises a silvered metal frame with a glass front and a sliding sheet brass panel on the reverse. The top of the frame is fitted with two loops to allow the frame to be suspended from a chain work around the neck. 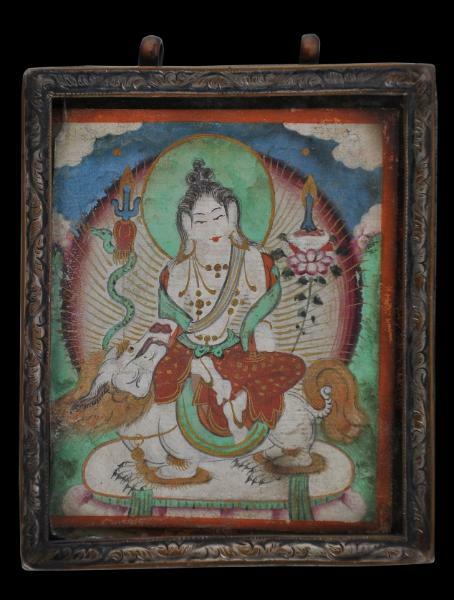 Inside is a small image painted in ground mineral pigments on cotton of Avalokiteshvara Simhanada (Tibetan: seng ge dra, chen re zi – which translates as ‘the Lion’s Roar, All Seeing Lord’). 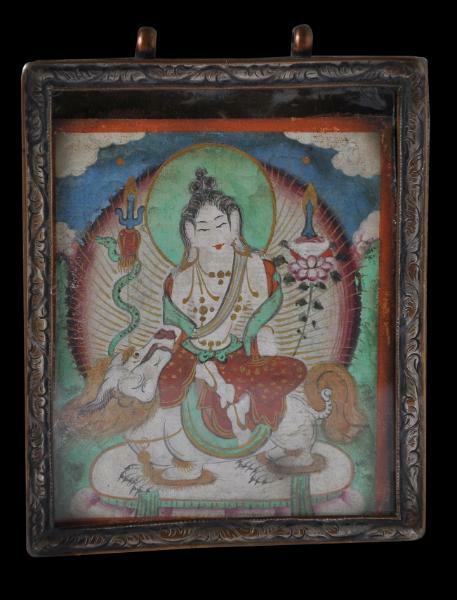 Such small talismanic images are known as a tsakli in Tibetan but a sakhius in Mongolian. 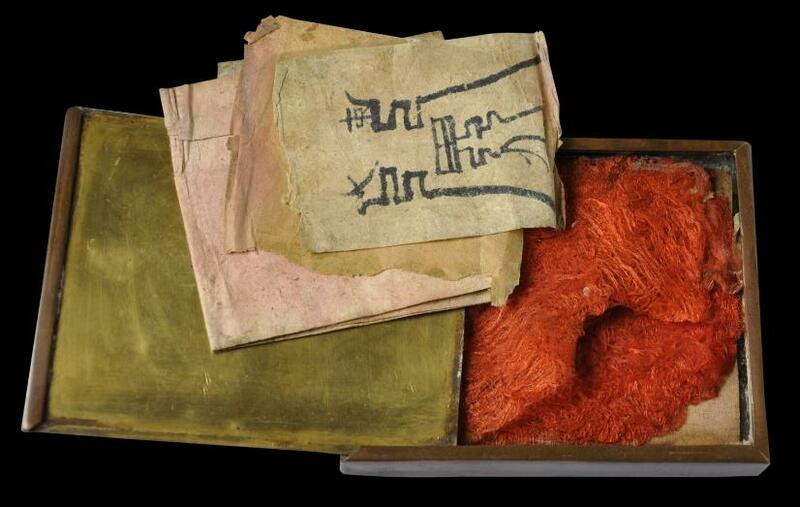 Enclosed in the case, behind the painted cotton image, are several pieces of old, hand-made paper, one printed in stylised script, and some textile – possibly a small section of a monk’s robe. Two bodhisattvas are identified by the fact that on occasion, they ride lions: one is Manjushri, the bodhisattva of wisdom; the other is Avalokiteshvara, who sits a lion in the Simhanada form, or Avalokiteshvara of the Lion’s Roar (Avalokiteshvara Simhanada). In both, the roar symbolises the intensity of the moment of enlightenment. Two similar amulet cases with frames are illustrated in Geoffroy-Schneiter (2011, p. 167). The item here is in fine condition. There is age-related rubbing to the silvering of the frame (as one would expect and indeed hope for). The glass has uneven edges but this is obscured by the frame. The painted picture is clear and well-preserved.